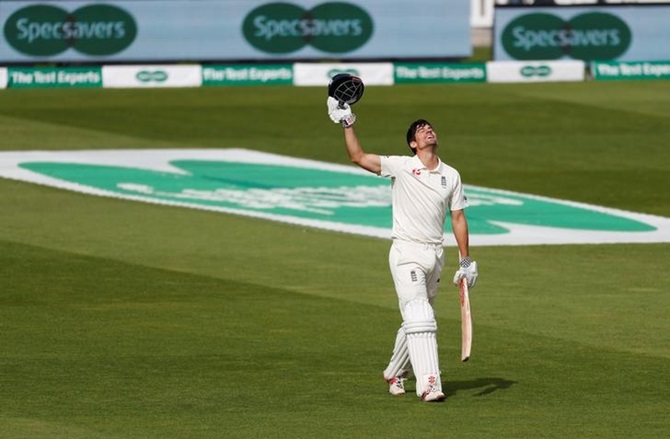 England batsman Alastair Cook said he could not have penned the final chapter of his Test career any better after he signed off with a memorable 147 against India at the Oval on Monday. Starting the day on 46 not out, the 33-year-old left-hander played with the kind of fluency that has been missing from his game this summer as he reached three figures for the 33rd time to help England score 423-8 declared. Already his country's most-capped Test player with 161, run maker and century compiler, his final flourish with the bat took him to fifth on the all-time Test runs list with 12,472. 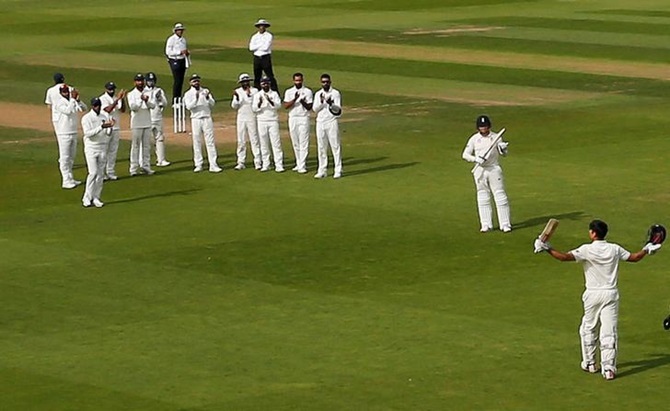 Cook, whose measured batting has propped up England for 12 years, was given numerous standing ovations throughout an unforgettable day for him and the 19,000 fans who crammed into the historic ground to watch his farewell knock. "You couldn't have scripted it. Today was one of those days when you'll forever look back and think wow. 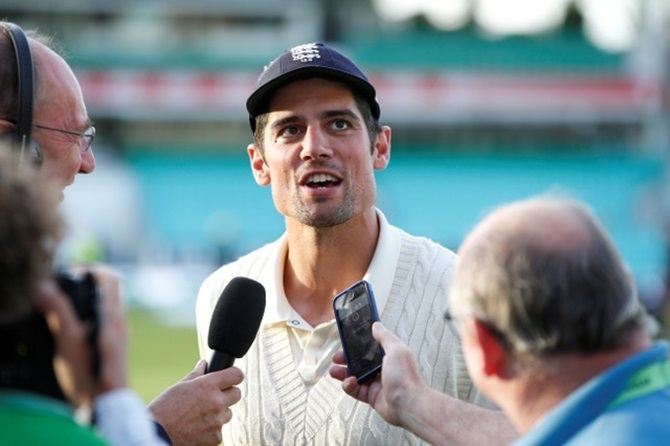 It has just been a great week," Cook, whose pregnant wife and two children were supporting him from the stands, said. "Ever since it (my retirement) was announced (last week), you hope you have a good week but to top it off with a score here was just incredible." Cook played with freedom to reach 96 but could hardly have imagined how he would reach three figures as a wild throw from the boundary gifted him overthrows and a 'five'. "As soon as I saw (Ravindra Jadeja) not anywhere near it I thought 'hang on a minute... hang on a minute'. "Then obviously it erupted. Saved me a lot of heartache." The standing ovation that followed, one of eight Cook received during the day, felt like it went on forever. "The ovation was just incredible. That's probably the only one I've really taken in and thought 'wow!'. "Then obviously the last 10 minutes as well today was special," Cook added of the concluding overs when the crowd chanted his name continually while he fielded. "It's just been the most surreal four days of my life." Despite knocks of 71 and 147 at the Oval, he said it is the right time to be stepping aside. "This is not just the culmination of three or four low scores, bad games in a Test series," Cook, who until his first innings here had made only one half-century in his previous 16 Test innings, told reporters. "It's been something that's been coming for 12-18 months, not just a bit of bad form. That's happened to me a number of times in my career. It's just time for me - time for my family. "There is definitely something missing, even though this was a great day. But it's always nice people wanting a little bit more than trying to kick you out. To go out on your own terms when your last innings for England was a hundred is special." With India languishing on 58-3 and chasing 464, England should seal a 4-1 series victory on Tuesday. If James Anderson takes one more scalp to reach a career total of 564 wickets in the five-day format, he will surpass Glenn McGrath as the most lethal fast bowler in Test history. "I have been there for a fair few of Jimmy's milestones but to do it together tomorrow would be special," he said.